Work has been done on the slip on Timlin Hill Road. It is now open to traffic. Portsmouth City Council met on Monday evening and resumed business for the New Year. With Mayor and 3rd Ward Councilman Kevin E. Johnson absent due to illness, remaining council members elected to excuse the absent members, Johnson and 1st Ward Councilman Sean Dunn, and chose 5th Ward Councilman Gene Meadows to serve as the chairman for the meeting. On the agenda were items seen at the final meeting of 2018, this time up for a second reading. Those items included ordinances authorizing the City Manager to renew the leases for Shawnee Boating Club, Anchor Pad Boating Club, and Sciotoville Boat Club, Inc. along with an ordinance authorizing the payment of $250 to employees of AFSCME Local 139, an ordinance amending sections of the Codified Ordinances of the City of Portsmouth to substitute the words city manager for mayor, and an Ordinance to appoint Sam Sutherland to the position of city manager. The present members of council voted for all items to be passed for a second reading. During the portion of the meeting reserved for miscellaneous business and reports, City Manager Sam Sutherland stated that the final stages of the water line project are in service and estimates the pump station project to be completed by mid-February. Following the meeting Sutherland commented on the repair of Timlin Hill Road and stated the majority of the repair is completed.”The road is open to traffic. We want folks to drive on it to aid in compaction. Once the weather is right we will get the area paved,” said Sutherland. 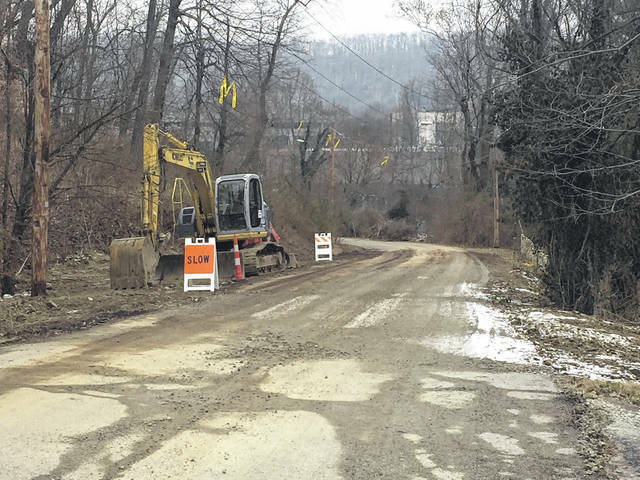 https://www.portsmouth-dailytimes.com/wp-content/uploads/sites/28/2019/01/web1_Timlin.jpgWork has been done on the slip on Timlin Hill Road. It is now open to traffic.